Jan shared this really quick tip about how she uses Whink rust remover for stains on her son's uniform, and although it was short I thought it was so helpful I wanted to call more attention to it. 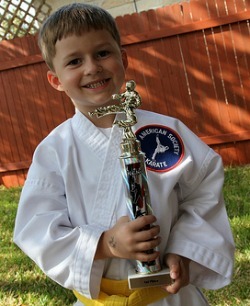 I learned to use rust remover (I used Whink) on my kids' white karate uniforms to remove all stains. Thanks for the quick tip Jan! I've had such wonderful and positive reviews of Whink Wash Away and Whink No More Yellow that I've been wanting to hear some reviews of this rust stain remover for some time now. When learning a bit about the product I learned that it can be used on colorfast clothes and carpet. In addition, it can also be used white sinks and toilets. Have you used this product? If so, I'd love to hear what you thought about it. You can share your review here, or read other rust stain remover reviews already submitted. Join in and write your own page! It's easy to do. How? Simply click here to return to rust stain removers. 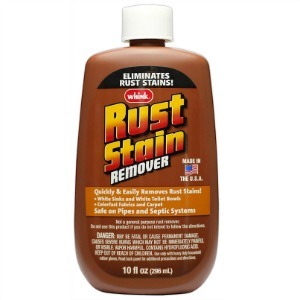 I have used this product to remove rust stains from carpeting. It worked quite well. You only need to use a small amount, so I would recommend purchasing the smallest size. Thanks for the tip Jan. The product says it's safe for colorfast carpets, but I would always suggest doing a spot test first in an inconspicuous area just to be on the safe side. But glad to hear it worked so well for you! I would love to hear even more reviews of this product, so submit yours here and I'll add it to the page, or check out even more reviews already submitted. Further, I've got lots of carpet stain remover reviews here if you're looking for something specific.